Melinda slipped the pistol into her purse and stepped onto the last train car as the doors closed. The engine lurched forward with a metallic screech despite its magnetic levitation plates. The train car was hot with activity and thick with humanity. She was used to cars further up the train with leg room and tea service. This time period didn’t have those luxuries. Much had been lost in the Radiation Wars just a decade prior. Many more decades would pass before mass transit returned to the finer things. She weaved her way through the narrow aisles of screaming babies, grumpy old men, and hired guns. Yes, she’d noticed the mercenaries despite their disguises. The dirt was too carefully applied to their faces. They were just a little too obnoxious in their reverie. Their period clothing was a little too authentically ripped and smudged. Their eyes watched everyone while watching nothing. If she hadn’t written the book on blending into a time period, she’d have never noticed them. They’d see her. 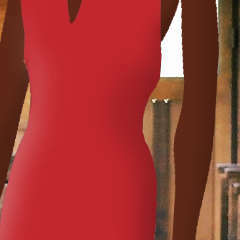 The dress would take care of that, particularly as it played against her dark skin. No one wore bright colors in this now, too much dust and smog dulling everything. She had to bring it to the station in a hermetically sealed bag, or a coating of gray dirt would have killed the effect. She didn’t like leaving her time shifter behind, but it would’ve spooked her quarry. She pulled open the door at the far end of the car, and winked at the mercenary who sat nearest it. He paused mid dirty joke and stared, cigarette clinging precariously to his lip. She stepped through the bridgeway and opened the far door. More mercenaries and a smattering of real riders plus a few chickens filled this car. She walked straight to the far end. As she pulled on the handle of the next door, the door she’d come through opened. The mercenary she’d winked at came through, gun drawn, followed by his compatriots. Train riders grabbed their children and sheltered in place. No one screamed. While unwanted, this was not uncommon. She closed the door and stopped on the bridgeway. She waved at them through the door’s large window. She pulled a small thermal fuser from her purse and placed it on the door handle. The fuser hissed. It melted the door mechanism into a solid lump of metal. She waved at them as they yanked at the door. She yanked open the opposite door and walked straight into the dual barrel of a plasma shotgun. “’lo, Melinda,” said the owner of the gun. His right eye looked down the barrels and his finger itched at the trigger. “Not hiding. Waiting,” Brock said without removing his eye from the sight. He was a wall of a man in the loose garb of the Green Saharans, the ruling tribe of the area. She knew he had no affiliation with them. Brock laughed and signaled to two of the mercenaries who’d finally gotten through the door Melinda melted. One took her purse; the other tied her wrists behind her back with a rough-hewn rope. “Alright, let’s go see him,” Brock said. He pushed her, forcefully, but not roughly toward the other end of the car. “He’s not still mad about that whole trying to blow him up thing, is he?” she asked. Brock brought her to the end of the car and on through the next car and the one after that. The population of each car both thinned and grew in mercenaries as they passed from one to the next. Finally in a car with cushions and fewer people than seats, Brock pushed Melinda into a seat. She sat across from a man wearing loose fitting robes, a headdress and sunglasses. “Hello, Mrs. Quinn,” the man said. The mercenary who’d grabbed the purse held it out for Horatio. Horatio took in and held it in one hand. “Your beauty supplies?” he asked with a cruel smile as he opened the purse. Melinda fidgeted as Horatio pawed through it. “And what do we have here?” Horatio asked, pulling out the pistol. His cruel smile somehow became crueler still. “Hoping to shoot me again, huh? To take my other eye?” He pointed the weapon at her. He pulled the sunglasses from his face. A ghastly hole replaced his left eye. Horatio put the pistol to Melinda’s forehead, smiled, and pulled the trigger. Melinda’s head snapped back. The world around her and Horatio slowed to a crawl. Spit from Melinda’s mouth hung in the air. Two men appeared, moving unimpeded by the slow motion world. They wore clothes of another era and large clock-like mechanisms on their chests: time shifters. One man grabbed Melinda the other handcuffed Horatio. The world turned green and then blue and then violet as all four of them shifted through time. “A tracer round?” Horatio asked. He looked over at the man who’d handcuffed him, Samuel Quinn. The second man, Dr. Alfred Bromsley untied Melinda’s wrists. The handcuffs rusted for decades before their eyes until they fell right off. Horatio socked Samuel in the jaw, pushed Bromsley down, and dodged a kick from Melinda. He turned yellow, orange, and then red as he time shifted away. Melinda stepped over to a computer terminal and typed in some commands. A moment later a man’s face popped on screen.